Women who drink a glass of wine a day are more likely to develop a range of cancers than are teetotallers, according to the largest study ever conducted into drinking and cancer. A daily drink was found to significantly raise the risk of breast, liver and rectal cancer, and is estimated to account for more than 7,000 extra cases of cancer each year in the UK. Researchers at the University of Oxford said the findings, which are part of the Million Women Study, make clear that even light, regular drinking can be a serious threat to health. While alcohol seemed to reduce the risk of some very rare cancers, such as kidney, non-Hodgkin lymphoma and thyroid tumours, it raised the risk of others. For every 1,000 women, drinking regularly once a day was linked to 11 extra breast cancers, one more oral cancer and one additional case of rectal cancer each year. Cases of oesophageal, laryngeal and liver cancer all rose by 0.7 extra cases per 1,000 women up to the age of 75. 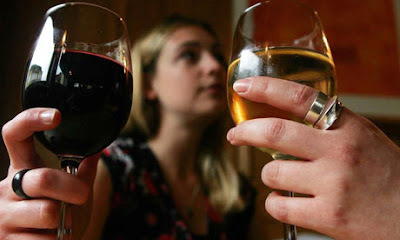 The increase in cancer risk was the same whether women drank wine, beer, spirits or a mixture. Smoking is still by far the largest single cause of cancer, accounting for around one third of all diagnosed cases. Diet and diet-related factors, such as obesity, are thought to explain a further third, with alcohol accounting for around 5% of cancers. The recent revelation that even one small glass of wine a day increases the risk of breast cancer was greeted with scorn by many women. But it came from the biggest survey ever conducted into the health and habits of Britain's females, and its findings cannot easily be dismissed. It is the Million Women Study, run by some very senior scientists at Oxford University. In research, size really does matter - and this is the biggest project of its kind on the planet. Well over a million women - 1.3 million to be accurate - were recruited across the UK, some as far back as 1996 and the last in 2001. Most were in their 50s, invited with the help of the NHS breast-screening service the first time they went for a mammogram. The information they have shared about their lifestyle, history, health and habits, together with the data that is being gathered over the years about the diseases they get, is a goldmine for researchers. Once you stop drinking, your increased cancer risk starts to melt away. It's the same with HRT. And even with smoking. "If you give up smoking, within five years your risk of lung cancer has halved," Beral says. "It's about what you are now. You can change it. The only exposure that I'm sure does persist is radiation. It mutates the DNA directly. But most of what we see seems to be reversible." And to finally finish off with some more interesting news, Just a few sessions of heavy drinking can damage someone's ability to pay attention, remember things and make good judgments, research shows. The research, to be published in the journal Alcohol and Alcoholism, is significant because binge drinking is so widespread in the UK. Twenty-three per cent of men and 15% of women drink more than twice the government's recommended daily limit. For men this means consuming more than eight units a day and for women more than six, according to the Office for National Statistics. I hope we all know that Islam forbids drinking and smoking. Please see this for further details.